Silence for the Reader Appreciation Award. His blog features some great poetry and other writing, and is well worth checking out. Thanks for the nomination :). Include the award logo somewhere in your blog. Answers the 10 included questions. Nominate 10-12 blogs you enjoy. Provide links to these blogs and let the bloggers know that they’ve been nominated. Thank and link your nominator. 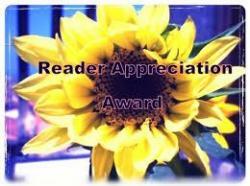 You are currently reading Reader Appreciation Award at The Muses Palette.